TRAPPIST-1 is a dwarf star only 40 lightyears away from Earth. Recently scientists announced the discovery of seven Earth-size planets around the star. On Thursday, 9 March 2017, scientists from the University of Bern will speak about the findings. And as a special guest SF writer Laurence Suhner will read her latest novel. The event is open to the public, registration is mandatory. On 22 February 2017, NASA announced the discovery of seven temperate Earth-size planets around the nearby ultracool dwarf star TRAPPIST-1. After an intensive photometric monitoring campaign of that star from the ground and with the Spitzer Space Telescope the observations revealed that at least seven planets with sizes and masses similar to the Earth revolve around TRAPPIST-1. Among the scientists behind the discovery is Prof. Brice-Olivier Demory from the University of Bern. 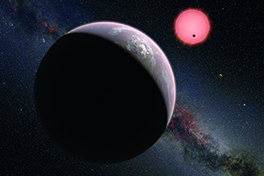 At the event «Earth-like exoplanets – Planets around the dwarf star TRAPPIST-1» Prof. Demory will talk about the discovery of the planets. Prof. Yann Alibert, University of Bern, will talk about computer simulations that predicted such planets around dwarf stars. As a special guest Laurence Suhner, science fiction author from Geneva, will read her short novel «The Terminator» that tells the story about the planets around TRAPPIST-1. The novel has been published in the same edition of «Nature» as the discovery of the planets. Suhner will also read an excerpt of her previously published trilogy «QuanTika». Prof. Kevin Heng, Director of the Center for Space and Habitability at the University of Bern, will introduce the speakers and will later lead a panel discussion with the speakers. For the discussion Dr. Zoë Lehmann, Department of English, University of Bern, will join the panel. Short talks and a panel discussion about the latest discoveries with Prof. Kevin Heng, Prof. Brice-Olivier Demory, Prof. Yann Alibert, Dr. Zoë Lehmann and Laurence Suhner, science fiction author.